Jon Pitman casts his ballot at the Lewiston Memorial Armory on Tuesday. Pitman's grandchildren, Kazuchi and Ayana Suzuki, came with him to vote. LEWISTON, Maine — A proposed merger of Lewiston and Auburn was crushed at the ballot box Tuesday, ending a divisive three-year debate that even supporters of the bid have said they don’t want to have again anytime soon. More than 84 percent of Auburn voters and 66 percent of Lewiston voters rejected the merger, according to unofficial results. The well-funded effort was backed by members of the business community and would have created a 59,000-resident city spanning both sides of the Androscoggin River. But it ran up against deep-seated cultural resistance in a state and area that values local government. 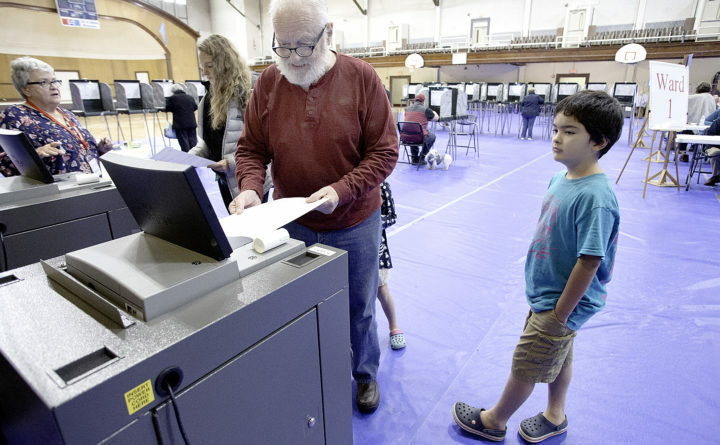 Voters in Lewiston and Auburn — albeit not many of them — kicked off the merger process in a low-turnout June 2014 election in which they picked a charter commission that produced the draft charter and consolidation agreement that would have merged the cities by 2020. It paid for a key 2017 study justifying the merger, finding that the cities could save between $2.3 million and $4.4 million annually. They would have formed Maine’s largest school system with 9,000 students. Their population would be just 8,000 fewer than Portland, the state’s largest city. Strange bedfellows came out of the woodwork to support and oppose the bid: Gov. Paul LePage and Lewiston Mayor Robert Macdonald supported the merger alongside most of Lewiston’s Democratic legislative delegation, but five of seven mayoral candidates in both cities opposed it. Gene Geiger of Lewiston, the CEO of the advertising company Geiger and chair of the charter commission, was perhaps the merger’s most prominent backer. He told a reporter Monday that he was looking forward to the end of the difficult campaign. But the two cities were too entrenched for Geiger’s effort to win. Two Maine municipalities haven’t merged since Dover and Foxcroft in 1922, though Lewiston and Auburn have shared services dating back to fire protection and water districts and a railroad in the 1800s. At Sherwood Heights Elementary School, a suburban polling place in Auburn, 61-year-old Greg Poliquin said he opposed the question in part because he didn’t buy proponents’ cost claims. “I think Lewiston has a lot to gain and Auburn has a lot to lose,” Poliquin said.